The proposed tunnel would be on the red & green bit next to Amersham on this map. Click to enlarge. In a desperate attempt at a bit of greenwashing, the Government has said that it is delaying the decision on whether to build the high speed rail project until January. 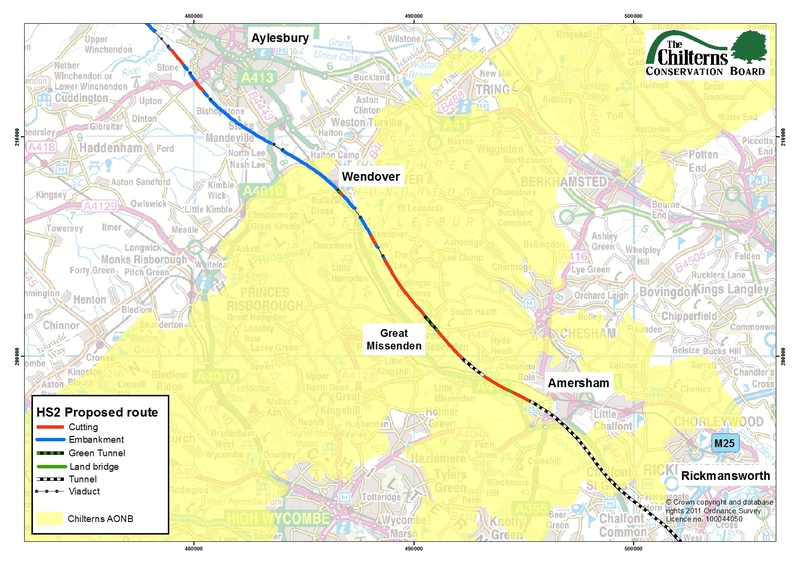 The Government is proposing to build an extra mile and a half of tunnel under the Chilterns, which would still leave the 225mph railway exposed for five miles in a statutory designated Area of Outstanding Natural Beauty. This move would also mean that materials and equipment depots and construction workers accommodation would have now to be sited inside the AONB. To find half billion pounds to pay for the tunnel, mitigation measures on other areas of the line which includes almost 50 ancient woodlands and 170 wildlife habitats, would be downgraded. In today’s Independent- Tuesday, 6th Dec- there is an article which will please some people and depress others. The current edition of ‘Rail’ magazine also features pieces both pro and con the scheme, together with recent suggested amendments, written by Nigel Harris and Christian Wolmar and a report on the dispute Virgin and National Rail concerning restrictions that prevented Virgin from running reliable puntual services on the WCML. Yes,John, “it was brought to my attention” as people say who don’t normally read that paper.I thought the most revealing reference was to Adonis telling Brown the only Cabinet job he wanted was Transport,on the condition it included endorsement of HSR.What cool arrogance,if true (though it may be apocryphal).Such is how our “democracy” works.An unelected lord dictating to the P.M! So much of this sorry saga has been decided behind closed doors,including Cameron’s consent when leader of the Opposition.We’ve been led to believe that one government could not bind a future administration in this way.Who knows?D.C. never denied it after I raised this point in my letter to him last year,but then he was abroad at the time,and a non-committal response came from a secretary.